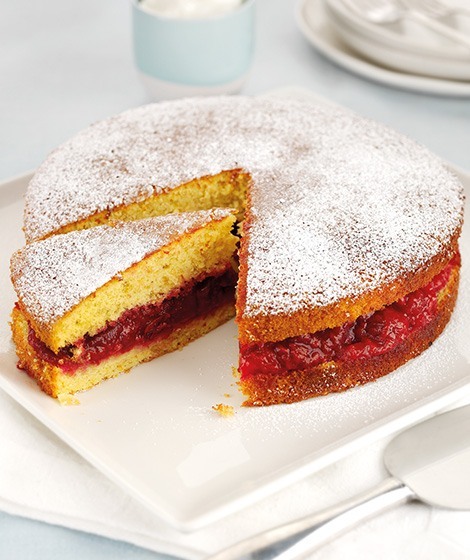 A delicious sponge that's low in saturated fat and salt - so you can enjoy it all the more! Preheat the oven to 200°C, gas mark 6. Grease and base line a 20cm cake tin. Whisk the eggs and sugar until thick, pale and doubled in volume. Gently fold in the flours and then fold in the vanilla and oil. Pour into the prepared tin and bake for 15 minutes until golden. Remove from the tin and allow to cool. Make the compote by placing all the fruit in a large saucepan with 2 tbsp water, cover and cook gently for 10 minutes, stirring occasionally until the fruit is softened, remove the lid and cook for 2 minutes. Allow to cool. Cut the cake in half and fill with fruit. Dust with icing sugar if using. Try using summer berries such as raspberries, strawberries and blueberries and serve with a dollop of low-fat crème fraîche.